Harris Boats continues to lead the pontoon industry in developing cutting-edge technology. 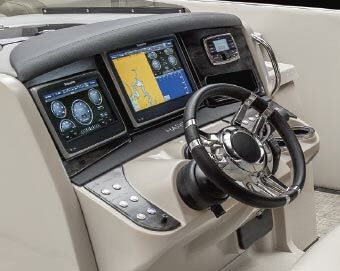 The new Glass Dash, available on Grand Mariner SL, Grand Mariner SEL, and Crowne pontoons, provides an unrivaled user experience. The panoramic touch-screen displays allow complete stereo control with Bluetooth streaming audio, Navionics® gold navigation, lighting control, and even engine instrumentation to give the driver instant performance information. Both the 7-inch and the 12-inch displays are clearly visible in direct sunlight with brightness control and the touch screen is constructed of chemically-strengthened glass enhanced with an advanced anti-reflective coating to help prevent fog over. The Glass Dash also adds cruise control and can be paired with an aft-facing camera that is mounted in the Delta Tower or Sport Arch.